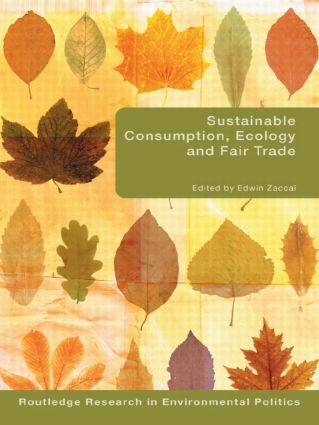 This timely volume discusses the debates concerning sustainable consumption and the environment. Sustainable consumption stands as a wide objective that attracts a growing attention within sustainable development policy circles and academic research. The contributors examine a range of interesting and relevant case studies including: household energy consumption, sustainable welfare, Fair Trade, Oxfam Worldshops, cotton farming and consumer organizations. explore realistic modes of interaction and innovation for changes in which consumers are involved. This text will be of interest to students and scholars of politics, environment studies and sociology. Over recent years environmental politics has moved from a peripheral interest to a central concern within the discipline of politics. This series aims to reinforce this trend through the publication of books that investigate the nature of contemporary environmental politics and show the centrality of environmental politics to the study of politics per se. The series understands politics in a broad sense and books will focus on mainstream issues such as the policy process and new social movements as well as emerging areas such as cultural politics and political economy. Books in the series will analyse contemporary political practices with regards to the environment and/or explore possible future directions for the ‘greening’ of contemporary politics. The series will be of interest not only to academics and students working in the environmental field, but will also demand to be read within the broader discipline. Environmental Politics addresses the needs of students and teachers, and the titles are published in paperback and hardback. Routledge Research in Environmental Politics presents innovative new research intended for high-level specialist readership. These titles are published in hardback only.